Father Pablo Gadenz will be returning to the Rome Experience in 2012 as instructor of the course “The Word of God and the New Evangelization” which is designed to give the seminarians an understanding of theology through the Bible focusing on the theme of the 2012 Rome Experience program, “The Priest, Minister of Divine Mercy”. Father Pablo Gadenz is Assistant Professor of Biblical Studies at Immaculate Conception Seminary School of Theology in South Orange, New Jersey. 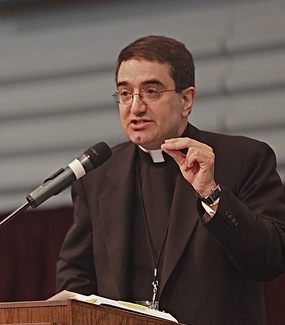 In addition, he serves as a mentor on the Seminary’s Formation Faculty. His research focuses on rhetorical analysis of Paul’s Letters and the study of Paul’s use of Scripture. He is also interested in the theological interpretation of Scripture, building bridges between exegetical study and the Church’s theology and liturgy. His published doctoral dissertation examines Paul’s ecclesiology in Romans 9-11, taking into account the Old Testament background of these chapters. Father Gadenz holds an S.T.D., Pontifical Gregorian University, Rome; S.S.L., Pontifical Biblical Institute, Rome; M.Div., M.A., St. Charles Borromeo Seminary; and, an M.S., Columbia University, B.S.E., Princeton University. Ordained in 1996, Father Gadenz is a priest of the Diocese of Trenton, and assists on weekends at Christ the King Parish in Long Branch, New Jersey.